Backgammon is a very prestigious board game and has been around for a long time. It is highly enjoyable but most people are unaware of the rules. The general aim of the game is to clear the board of all your checkers. The first player to complete this task wins the game of Backgammon. Backgammon is a game for only two players like chess or checkers. The board itself has twenty four points which are used for moving around on the board game. The board game is split into two sections with 12 points per section; 6 on each side. One of these sections is a player’s outer board and the other section is a player’s home board. There is a line which separates each section and this is called the bar. When setting up the board, you must place each of the player’s checkers on four different locations; these initial locations are the same every time. The points are numbered one to twenty four and the object of the game is to bring all of your checkers into the home section and then get them out of the game. A player always has 15 checkers to start with and these checkers always have the following initial placement; 2 checkers on the 24 point, 5 checkers on the 13 point, 3 checkers on the 8 point and 5 checkers on the 6 point. Both players have their own set of dice along with a dice holder for shaking the dice. To begin the game of Backgammon, each player must roll one die to determine who will go first. This number determines the number of moves permitted on the first turn of the player who wins the draw. The checkers cannot move backwards; they must always go towards their home board. This means that both players will be going in different directions. If the dice are the same at the draw then players must roll again until the dice are different numbers. There are some very important rules when moving your checkers. – A checker can only move to another point if it is not already in use by more than one opposing checker. You can however use the point if there is only one opposing checker on it. – A player has 2 dice to roll for each move. The 2 dice indicate 2 different moves, for example: a person who rolls a 2 and a 5 must move either 2 separate checkers 2 and5 moves or the player may also combine the results from the dice by moving only one checker 7 moves. This however must respect the open-point rule. 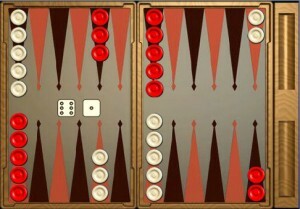 – When rolling doubles in the game of Backgammon, a player doubles the amount of moves permitted. An example of this is a player who rolls two 4s will now have four 4s. The player can move the checkers in any combination as long as it respects the other rules. For example 4 different checkers move 4 spaces or one checker moves 8 points and another checker moves 8 points. – A player must always play both dice if the movements are respectful to the other rules and a player must play all the doubles as well. If a player can only move one dice then it must move that one but a player must always play the maximum amount of moves possible. If a player cannot move any checkers legally then it becomes the other player’s turn immediately. When a player has only one checker on a point, the opposing player can use that point as well. If this happens, the checker which was first on that point goes to the middle section called the bar. When a player has two or more checkers in the bar, the player must get those checkers out of the bar in order to move the other checkers on the board. To get out of the bar, a player must use the number rolled from the dice like any other movement but this time it must go in the opposite direction into the opponent’s home board. This movement must respect all the other rules for moving a checker on the board. Once all of a player’s checkers have made it to the home board, they can begin to be taken out of the game. To get a checker out of the game, the player must roll a number which is equal to the point number that each checker is on. For example; rolling a four will get rid of a checker which is place on the fourth point. If there is no checker on the fourth point then a player must advance a checker from the fifth or sixth point by bringing it closer to the first point. In order to begin removing any checkers from the game there must be none of your checkers in the bar or anywhere else on the board; all of your checkers must be in the home board section. Once a player has successfully taken each of their checkers out of the game they have won. It is important to remember all the rules of movement on the board to avoid any confusion. Always use the dice holder to shake the dice to avoid having any doubts of cheating and avoid rolling the dice directly on the board so the checkers do not move around.